I can remember, as a teen, we swore up and down that Taco Bell beef was “kangaroo meat,” or “Grade Q.” Something to that effect. Of course, it’s been an eternity since I last ate anything from Taco Bell, let alone their beef… but I still can’t help but be tickled by this. Now… I don’t go in too much on fast food… I just say don’t eat it. If you ever wanted a real, true, honest and legitimate reason as to why? Check out the motherlode of processing secrets below. 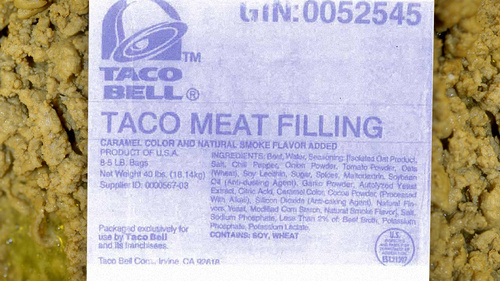 Taco Bell’s “beef” pseudo-Mexican delicacies are really made of a gross mixture called “Taco Meat Filling” as shown on their big container’s labels, like the one pictured here. The list of ingredients is gruesome. Updated. It looks bad but passable… until you learn that—according to the Alabama law firm suing Taco Bell—only 36% of that is beef. Thirty-six percent. The other 64% is mostly tasteless fibers, various industrial additives and some flavoring and coloring. Everything is processed into a mass that actually looks like beef, and packed into big containers labeled as “taco meat filling.” These containers get shipped to Taco Bell’s outlets and cooked into something that looks like beef, is called beef and is advertised as beef by the fast food chain. Can you call beef something that looks like ground beef but it’s 64% lots-of-other-stuff? Taco Bell thinks they can. That’s the reason why an Alabama law firm is presenting a class action lawsuit for false advertising—they are not asking for any money—saying that the fake Mexican food maker should label their processed clustermass of disgust as what it really is in all promotional materials, following USDA laws. It appears that they have a very good point. The law firm argues that the meatmud correctly labeled as “taco meat filling” in the industrial packaging should be labeled in exactly the same way in all advertising and packaging, as the USDA mandates. Of course, the All-New Double Decker with Two Times More Taco Meat Filling would not sound very good on TV. Taco Bell’s meat filling looks like ground beef before and after cooking, but it has been augmented with fibers and other substances to keep the price low. That’s how they can offer tacos for 99 cents—and that’s fine: There’s absolutely nothing wrong with their processed mixture apart from being gross. The problem here is that the consumers may believe that this “meat filling” is actually beef while it’s not. If it looks like beef, it’s labeled as beef, and it’s advertised as beef, then it must be beef—except that substance is not beef. It’s just “meat filling”. That could deceive the public, which is why there is a class action lawsuit in the works. Consumers have the right to easily learn what they are eating before making a decision to eat a taco or not, just like they need to know before buying cloned meat or genetically modified vegetables or products containing corn syrup. “Where’s the beef?” Wendy’s restaurants once famously asked through its advertising, a swipe at its competitors’ burgers. The same question is now being asked by a California woman regarding Taco Bell’s beef products, which she claims contain very little meat. So little, in fact, that she’s brought a false-advertising lawsuit against the huge fast-food chain. It says Taco Bell’s ground beef is made of such components as water, isolated oat product, wheat oats, soy lecithin, maltodextrin, anti-dusting agent, autolyzed yeast extract, modified corn starch and sodium phosphate, as well as some beef and seasonings. Just 35 percent of the taco filling was a solid, and just 15 percent overall was protein, said attorney W. Daniel “Dee” Miles III of the Montgomery, Ala., law firm Beasley Allen, which filed the suit. Taco Bell, a unit of Yum Brands Inc., did not immediately return a request for comment. For many menu choices, customers are given the choice of chicken, beef or carne asada steak as fillings for their Taco Bell products, such as burritos, Gorditas and Chalupas. “The ‘chicken’ and ‘carne asada steak’ served by Taco Bell is, in fact, chicken and carne asada steak. The ‘seasoned beef,’ however, is not beef,” the suit contends. Apparently, the industry — and Taco Bell internally — calls the substance “taco meat filling,” avoiding the word “beef,” according to the suit. However, even that term is supposed to be used for products that are at least 40 percent beef. Taco Bell’s taco filling falls short of that definition too, Miles said. So… they’re just gonna act like we don’t see the label? They’re gonna act like it’s not all over the Internet? If Tyson made that meat filling… what the hell else is Tyson doing? And what is autolyzed yeast extract doing in their ingredients list? Good article…. Taco Bell probably isn’t the worst offender either. I bet if you check the meat content of many of these major restaurant chains you will find similar evils. There is nothing inherently good about the fast ‘food” industry or any of the ingredients they put in our food. I cringe when I see little children eating this stuff and parents joyfully giving it to them, and when you tell some of them the truth, they don’t care. I really believe some people know they are eating garbage and still don’t care. SMH. We referred to Taco Bell as “cat food,” back in the day. I’m sorry, you’re not getting quality beef in a fast food item that costs as low as $0.79, lol. I really hope people aren’t too surprised that it’s full of fillers. To stretch a dime, ’tis what they do! I think THAT is what’s especially interesting, to me – I wonder if people are even really thinking when it comes to what they’re getting when they spend less than a dollar on a taco. I wonder if that’s classist to ask that question… because not everyone can afford to “be concerned about quality,” but I’m sayin’. You have to – at least – know that there is an issue of severely diminished quality, here. It’s just proof that fast food’s version of processed foods is, sometimes, worse than what you can get in the stores. Thanks so much for putting this together…I dont know whenever i went, I never ate the beef after taking a deep look at it when i was a teenager, not to mention it tore my stomach up the very last time i ate it. The news had someone on there saying that there is almost no protein in the meat which didn’t surprise me. We used to joke about it, too. Fast food (except Popeyes chicken) has never really looked like food from a restaurant much less the grocery store. While I’m glad someone is challenging them on what’s actually in their food, I wonder if people really thought that was real beef. I honestly don’t think people think twice about it. I mean, I seriously don’t think people think to question it. I don’t really think Popeye’s is concerned with what you put in your body either. I work in food industry for an all natural food co. My company produces a large majority of all natural products under various labels. I can tell you first hand that true quality ingredients cost money. There is no such thing as a $0.79 beef taco. EVER. If you want to eat fast food please PLEASE stick to Chipolte. Chipotle is awesome! Calorie laden, but awesome! Haha, calorie laden indeed but yummy, i haven’t gotten to the point where I cut that off yet, i’ve narrowed down to once a month. What the hell is isolated oat product??? aka, “lets find natural sound ways to pump chemicals into foods so customers will continue to buy our chemical laden products. While it is very interesting, I have wanted to throw my monitor to the ground at least twice in two pages, i fear for the safety of company equipment if i read much more lol. you have been warned. GURRRRRALLLLL! I have all kinds of problems with the company that runs Taco Bell KFC and Pizza Hut. This just adds more fuel to the fire. But it does sound like this goes way deeper than just these three. People eat Taco Bell and other fast food because it’s cheap and it tastes good. People won’t stop eating it unless there is something poisonous in it or if foreign matter like dirt or bugs are found in the not beef mixture. Ultimately, fast food isn’t good for anybody especially if one is trying to eat healthily. People crack me up…did we REALLY need a lawsuit to tell us Taco Bell, or any other fast food restaurant for that matter, is using straight up beef/chicken/fish?? Seriously who among us can say they’ve made tacos at home with beef that tasted anything like a Taco Bell taco?? Even if I break the beef up into really fine pieces it aint happening! LOL Someone else said it earlier but I highly doubt Taco Bell will see any significant dip in traffic because I would believe most people buying the “beef” tacos know they aren’t all legit.